March Coffee is a relatively new name in Exeter’s small but growing speciality coffee scene, opening, appropriately enough, on 1st March 2017. All we really need is for the owner to be called David, but alas, he’s called John, a Devon lad who moved up to London, where he worked for the likes of TAP and Caravan King’s Cross, before returning to Exeter to open his own coffee shop. March occupies a bright, open space on South Street, just behind the cathedral. The interior is beautifully uncluttered, with a variety of seating options. John, meanwhile, can be found behind the counter at the back, dispensing espresso-based drinks from a lovely three-group La Marzocco Strada espresso machine, complete with wooden side panels. The coffee is usually from local roasters, Crankhouse Coffee, although John sometimes rings the changes and gets a different roaster in. The coffee is bought in small batches and when it’s gone, it’s onto something else. If you don’t fancy coffee, there’s tea from Canton Tea Co, just up the road in Bristol, as well as soft drinks from Luscombe. If you’re hungry, there are sandwiches and an impressive selection of cake for you to choose from. It’s hard to miss March Coffee on the south side of South Street. It’s in a parade of modern shops set slightly back from the busy street, leaving space for a broad pavement that slopes noticeable from right to left. What makes March stand out is its massive single window, which stretches almost the full width of the shop, its progress broken only by glass double doors at the far right-hand end. Right in the middle of the window is the word March, emblazoned over an interesting logo of four hexagons. Naturally, this window makes for a very bright interior, which is just as well since March goes back a fair way, being perhaps twice as deep as it wide. It has a simple, uncluttered layout, with the seating kept to the edges, leaving a large, open space in the middle. The counter dominates the space, occupying the right-hand corner at the back, with the seating arranged in the window and along the left-hand wall. The exception to this is a four-person bar which is against the right-hand wall between the door and the counter. However, it’s not a great place to sit, with your back to the whole room and with people constantly coming past on their way to/from the counter/door. The remaining seating is much more appealing, starting with two high, six-person tables in the window, each with some striking blue stools. However, if you prefer more conventional tables and fancy sitting on chairs, then head to the wooden-clad left-hand wall, where you’ll find a row of three conventional four-person tables. Occupying the front half of the wall, they are followed by a set of retail shelves, where you can pick up various bags of Crankhouse Coffee. Beyond that is the final seating option, a very comfortable sofa against the wall, with a coffee table and four chairs. The counter is an impressive structure, with the short side facing the door. This is where you’ll find the tempting selection of cake, while the coffee part of the operation is along the long part of the counter, facing the left-hand wall. This is centred on the three-group La Marzocco Strada and its Mythos One grinder, although John is thinking of adding an EK-43, which will allow him to offer a guest espresso and/or filter coffee. For the moment, there’s just the single espresso which changes on a regular basis. John works closely with Dave, from Crankhouse, but every now and then he’ll get something in from a different roaster, such as London’s Caravan, where he used to work. While I was there, Crankhouse’s Guatemala Finca La Bolsa was in the hopper. 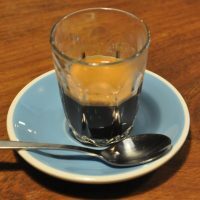 I had this as an espresso, served in a glass. It was lovely, a well-balanced espresso with an all-round mouthfeel and pulled commendably short. I was spoilt for choice when it came to the cakes, but my eyes were drawn to the lovely-looking doughnuts that had pride of place at the front of the counter, so I knew I had to have one. There was a choice between orange and lemon cream or blueberry, which I went for. The doughnut was lovely and light, but it was the blueberry cream filling that really made it for me. Delightfully rich and creamy, it was also disconcertingly purple… Delicious though! This entry was posted in Cake, Coffee Shops, Exeter, Laptop Friendly, Sandwiches and tagged include by Brian Williams. Bookmark the permalink.